Sometimes we just do something sweet with our another half. This is why we will wear couple t-shirts. In fact, this is one of the best options to tell the others that you are a couple. So, the question is, where you can find these tees. Here, we will show you the best designs that can be found on the internet. 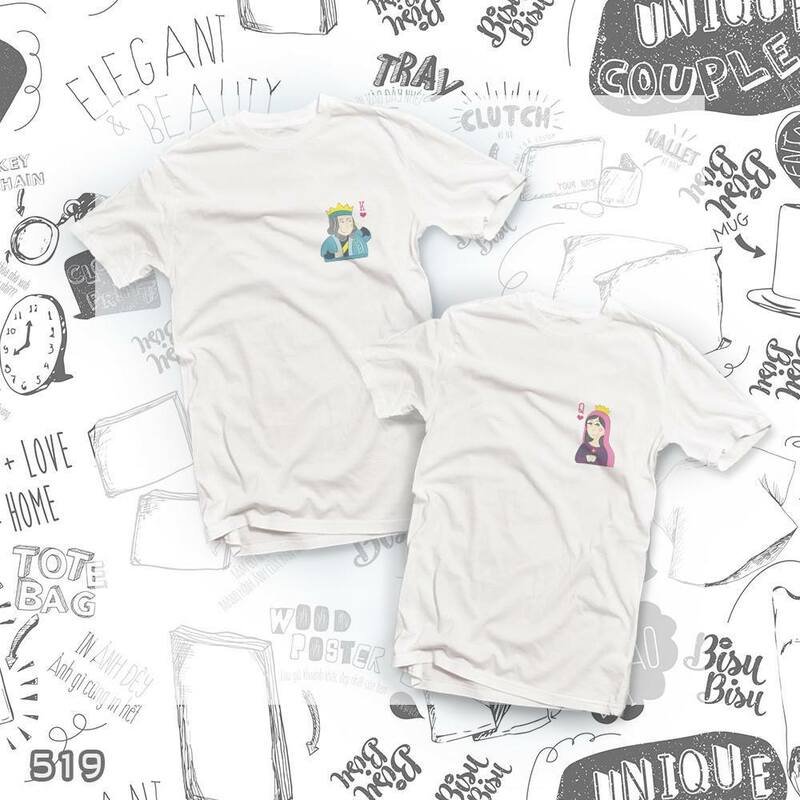 OK. Let us talk about some designs of couple t-shirts from Hong Kong. This is actually our own design. We actually love this design very much. The rabbits are holding the ears of each other. They just love each other. 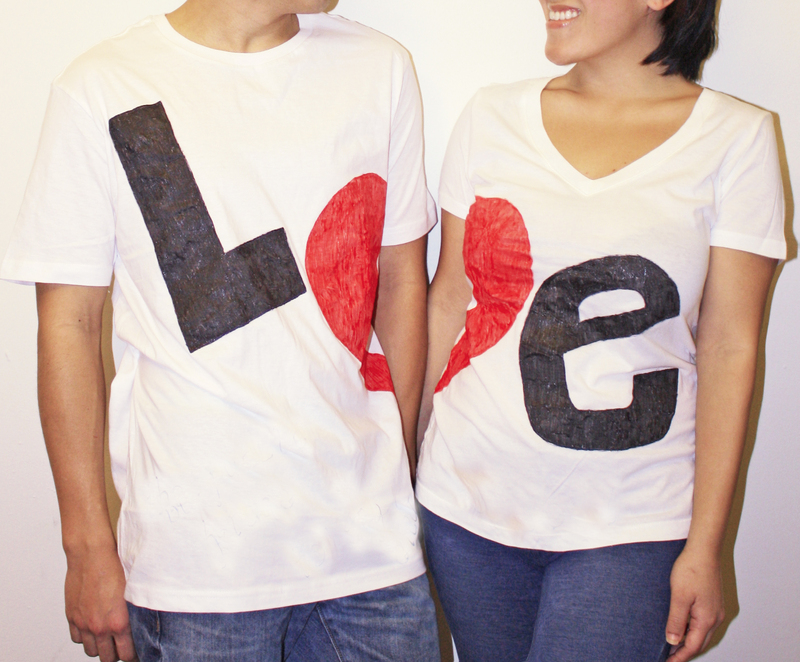 The name of you and your boyfriend / girlfriend can be printed on the t-shirts and this becomes a perfect design for you. This is also our own in-house design. No matter you are in Hong Kong or not, you should love this design. 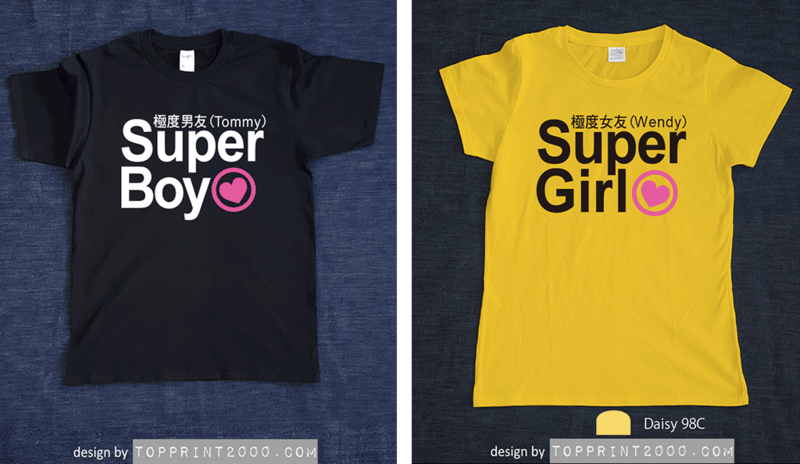 The tee for the girl is printed with the words “Super Girl” and “Super Boy” are printed on the other one. 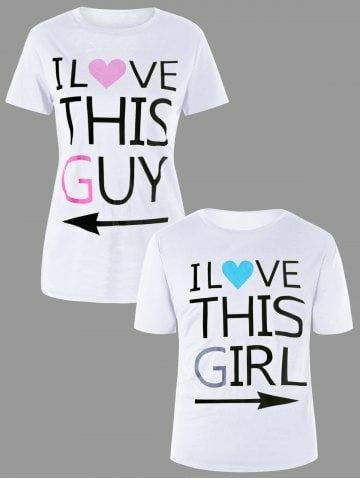 People will certainly know you are a couple once they see you wearing this! 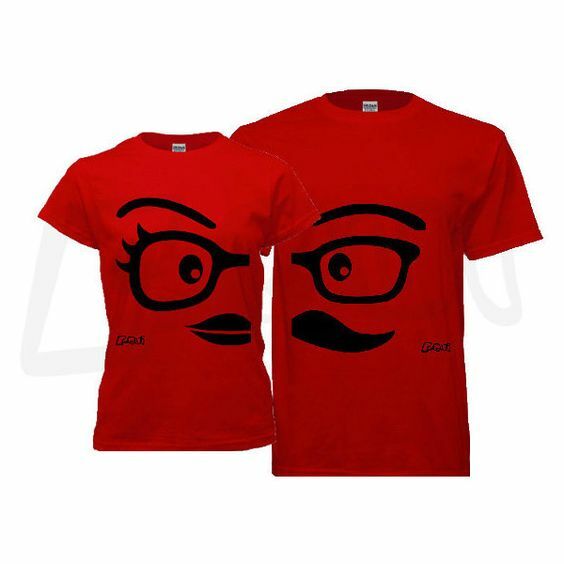 Of course we do not only talk about couple tee design from Hong Kong or from our store. Let us see some designs from other parts of the world. There are in fact a lot of excellent designs around the world. The man is the King and the lady is the Queen. 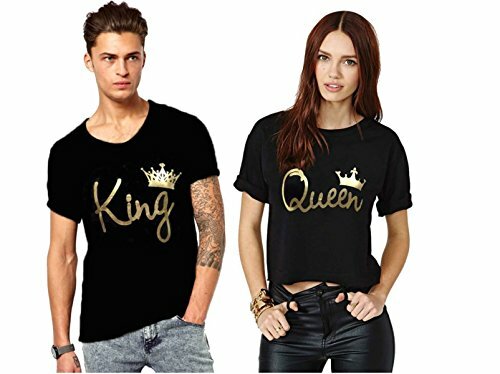 The crowns are designed differently on the two shirts. Yet, you will certainly know they are a pair of tees. 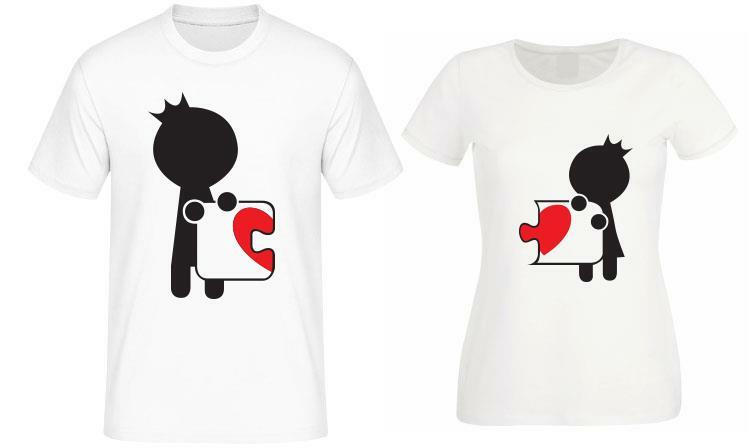 The main idea of this couple t-shirt is that there is a piece of puzzle coming from the heart. The heart is on one of the shirts. The puzzle is on the other one. This becomes a perfect match of shirts. This design is super sweet. “I am waiting for you”, the girl says. At the same time, the man says “I will be there”. This design is excellent in a sense that the two shirts are not with the same graphic. Actually this is not depicting any images from the movie. Yet, the concept of this design comes from the idea “Beauty and the Beast”. So, basically, the design of the girl tee is a bit cute. And on the other hand, the design for the boy one is with a dumbbell. 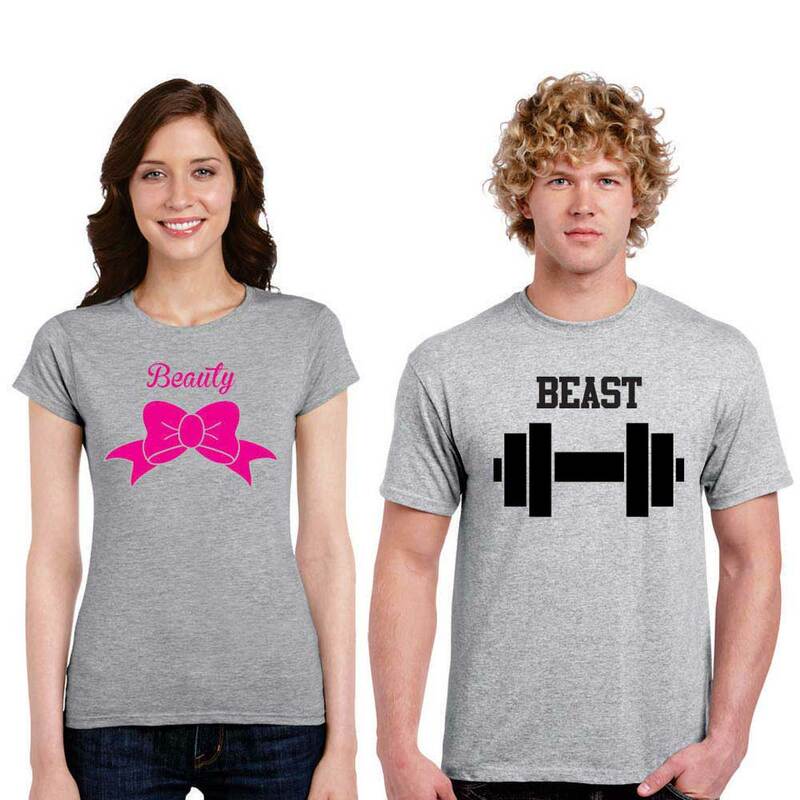 Of course, the words beauty and beast are printed on the shirts. 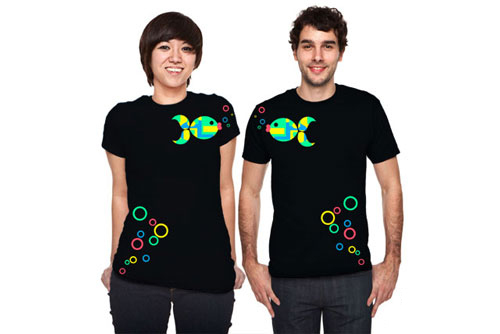 This is another perfect example that two different designs become a pair of couple t-shirt. One of them was printed with an icon which mimics an Ipod. 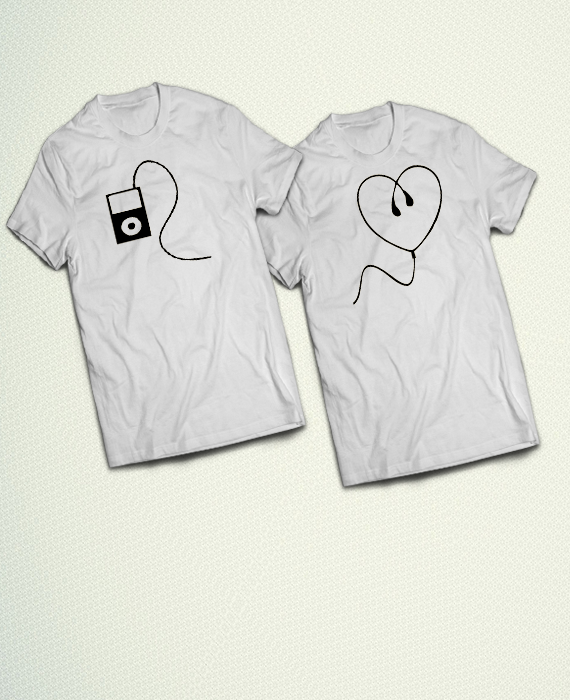 An earphone is printed on the other shirt. You may not know they are a pair of tees if you do not see them being put together. But we believe this type of design is in fact wonderful. This is also a design we love. A rocket is heading to a Planet. OK! Let us call it Planet X. Usually, the girl will be the planet and the boy will be the rocket. But you can just reverse it if you want. It does not really matter at the end of the day. 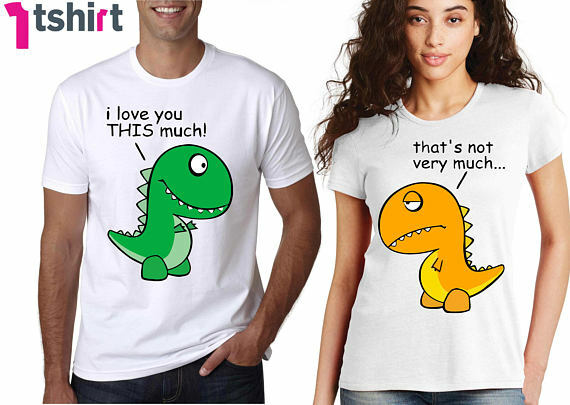 As couple tees, we will not say this design is excellent. This design is quite interesting though. 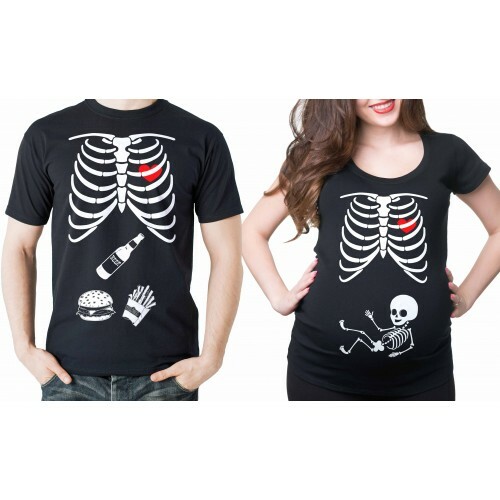 They are actually created as shirts for Halloween. This is why they are featured with skull and bones. They are actually quite cute. We especially love the one which the girl is wearing. The small skeleton is really cute. It looks like it is a baby. Well, it is not about a heart which is made of magnet. It is an idea that the heart will be attracted by a magnet. This is what love is. A person is attracted by another one. So, one of the person is just like the magnet. And the other one is the heart. Of course, they should be attracting each other. We will say that the heart itself is also a magnet! The main concept of this design derives from pokers. You have a Queen and you have a King. Of course, they are a couple. It is just so natural. What is special about this design is that the designer does not just create two poker cards. Instead, the designer creates abstract versions of the Queen and King. This is why this design is so interesting. We Go Together. 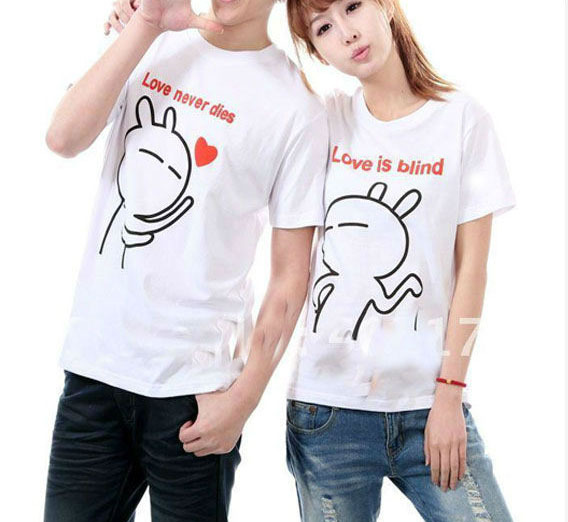 This is the main theme of this pair of couple t-shirts. The boy and the girl are riding one bike. The phrase is expressed as “We Go To-” and “Gether”. You will not be understand the whole phrase if you do not see a couple wearing them together. There are also two balloons on each of the shirts. You can see the word LOVE when they are put together. You should have heard this before. Right! Love at the First Bite. Yet, the designer of this design makes the idea cute. This is how the designer express and visualize this idea. A pizza is drawn. You cannot see the whole pizza without seeing both shirts. 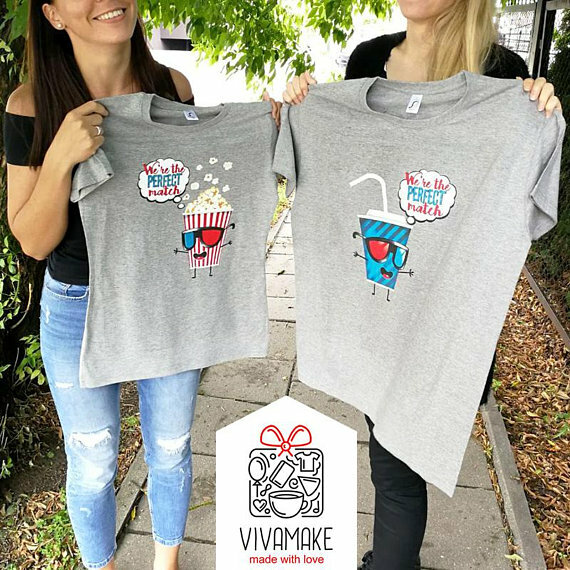 The words “Love at” are on one of the tees and of course you will see “First Bite” on the other one! We talked about a design which abstracts the idea of Queen and King from poker cards. This design comes from the same idea. Instead of abstracting the cards, they are actually drawn on the t-shirts. They are not big though. They are just two small cards on the shirts. And again, the design is cute. We love cute designs. So, we love this design! “Only you can make this world seem right. Only you can make the darkness bright…” This is an old but extremely romantic song. 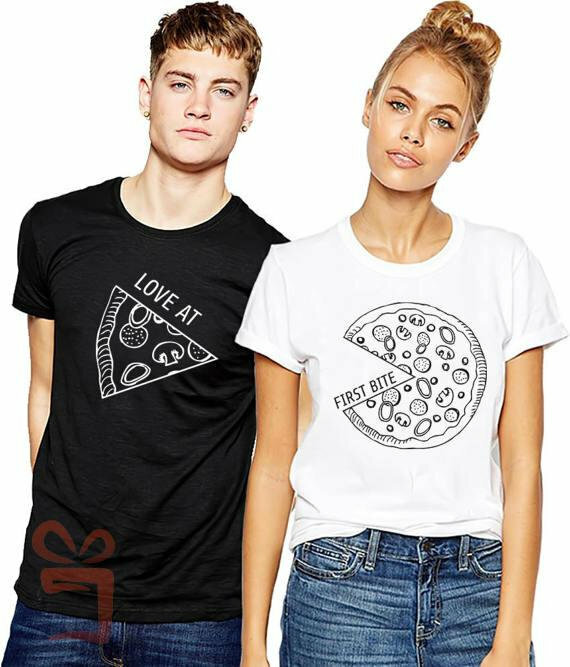 This couple t-shirt design is named after the name of this song. 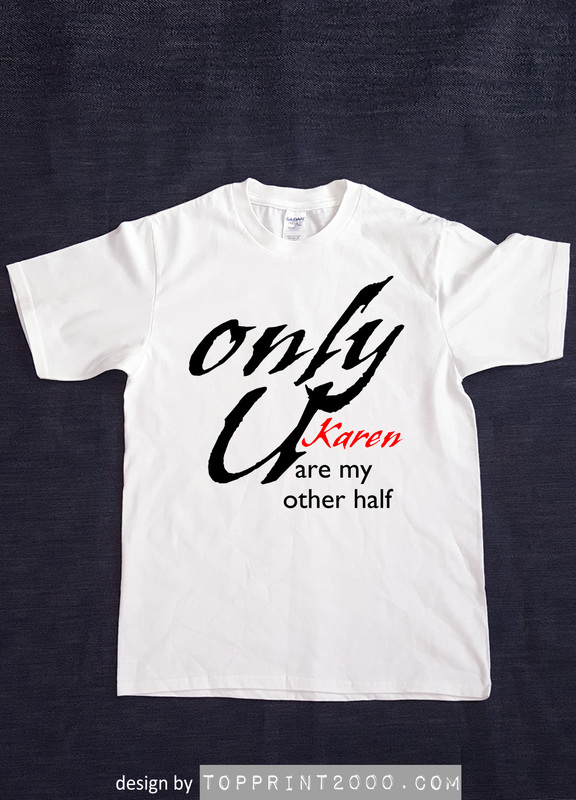 The words “Only U” are literally printed on the tee. The names of the couple will be printed on each of the shirts. It is a simple yet romantic design. This is in fact interesting as a t-shirt itself. 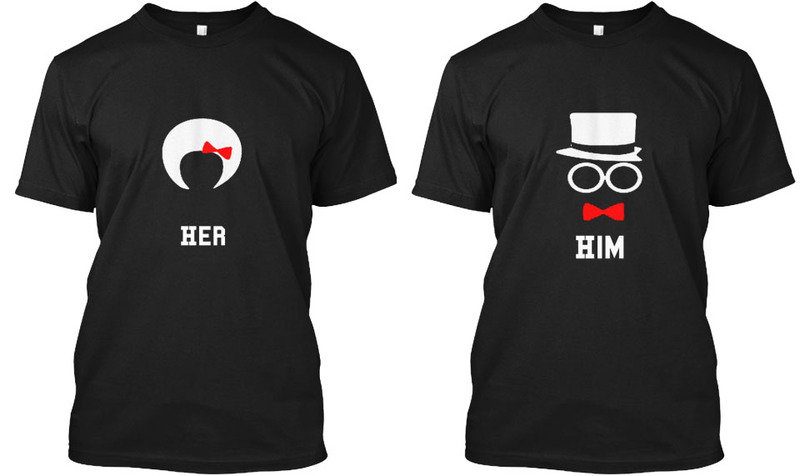 Although it is sold as a couple t-shirt, the shirts for male and female are actually the same. Yet, we love this idea of foodie, crazy and funoholic. This is why we include this design in our list. We have to stress once again that we love cute design. 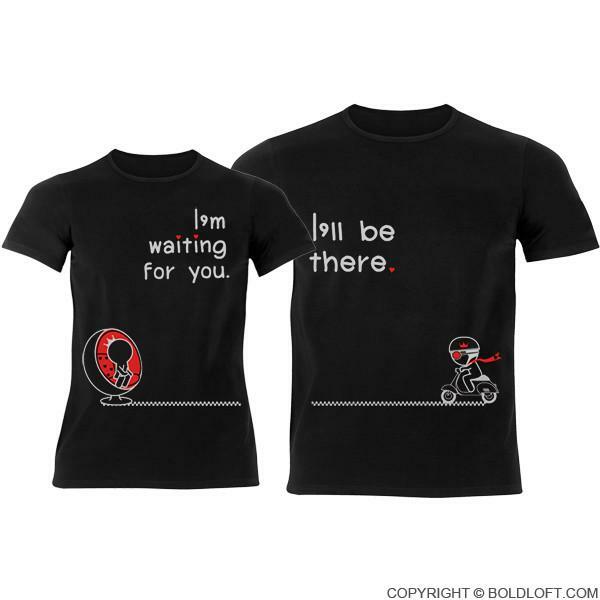 Just like the previous shirt we mentioned, the shirts for both people of the couple are the same. But… the panda is quite cute. And the result is, we include this in our couple tee list. Of course, a couple will always eat together. 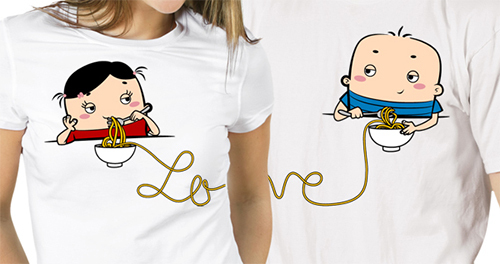 Although this couple is not eating the same bowl of noodles, the noodles have become the word “LOVE”. This is so cute and lovely. This is a design by an illustrator called JoJo. We love the illustrations from this illustrator. This tee is also very interesting. By flipping the graphics the original design becomes a couple tee design. You can just see two fishes are kissing each other. You can also see a lot of colorful bubbles. It is cute. It is interesting. Right! It is full of love. This is something you can find from a couple. Look at this couple t-shirt design and you can certainly feel it. It is not an extremely sophisticate design. You will see the whole word LOVE from these two shirts. There is a heart shape in between. It is designed in a way that it is like two pieces of puzzles. They can be joined together and become one heart. Is this what we call “Two as One”? This design can be excellent for Halloween. In short, the design features two skulls on each of the tees. One of the skulls is drawn like a man and the other one is designed like a woman. 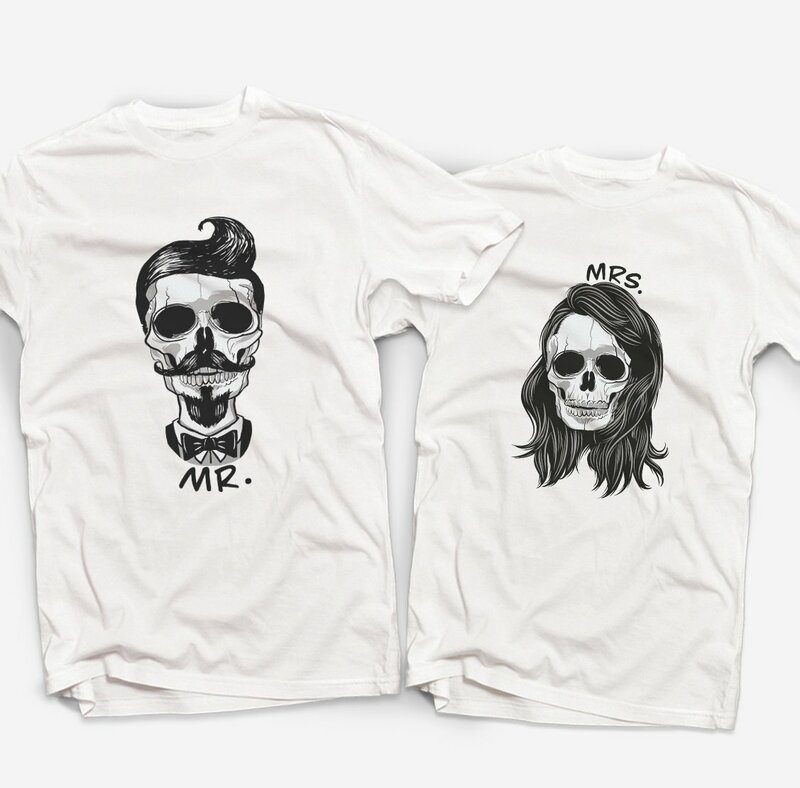 The words “Mr.” and “Mrs.” are printed on them to reinforce the idea of couple tees. Of course, a key is used to open a lock. This is the idea to generate this design. A key is presented on one of the t-shirts. On the other tee, you will see a lock. So, the key of one person of the couple will open the lock of the other person. This is certainly very sweet. The design is also quite cute. There are designs which are very Hong Kong. Without any surprise, there will also be some designs which look very Korean. This is certainly one of them. You can see two cute figures, which look like the emoji you may use for instant messengers. These figures just signify love. People who want something with an oriental touch will love this. It is a bit similar to the idea of the Magnetic Heart mentioned before. This design, however, is a bit more sophisticate. You can see there are two robots. To be exact, there is one male robot and one female robot. 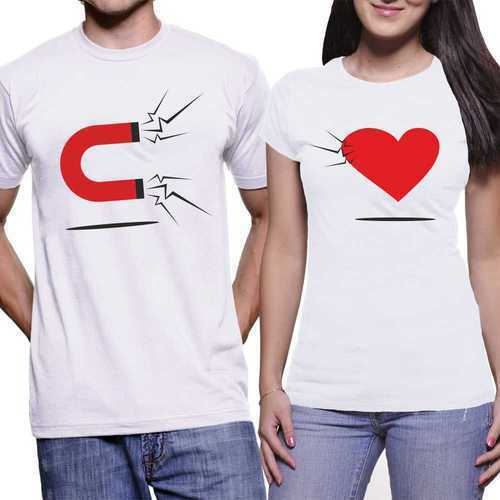 The female robot is holding a magnet to attract the heart of the male one. Yes, the girl just attracts the boy. This is just a couple. 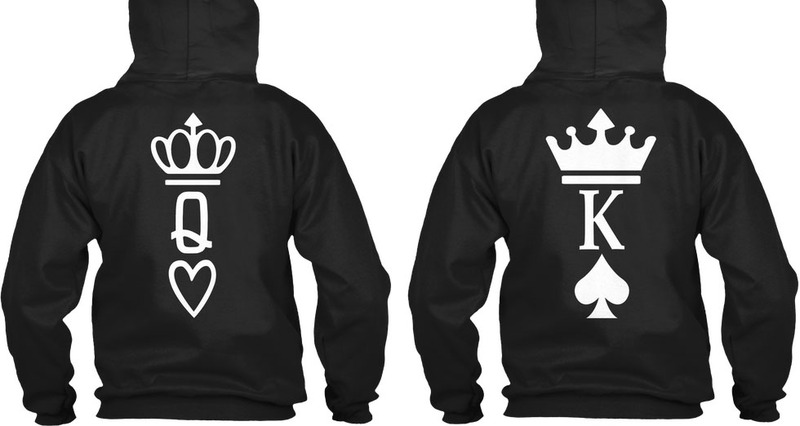 This is also a design which depicts the idea of a queen and king. Yet, it will be more suitable for couples who love sports, especially football. 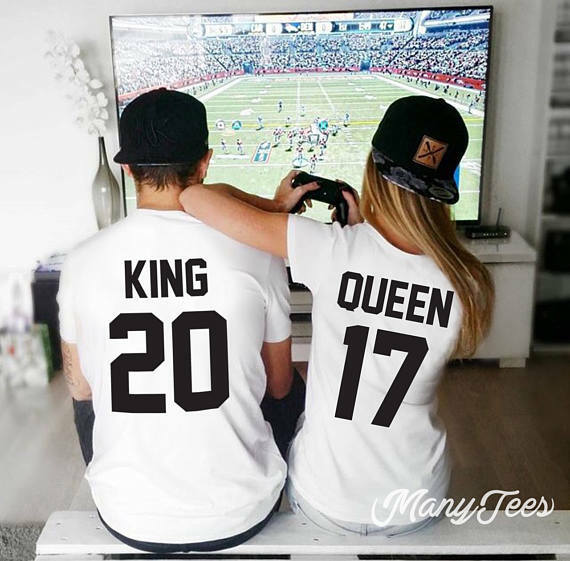 These couple t-shirts are designed like football shirts. There are numbers on them, under the words “Queen” and “King”. It will be excellent for couples to wear them together when they are heading to a pub or bar to watch football matches. 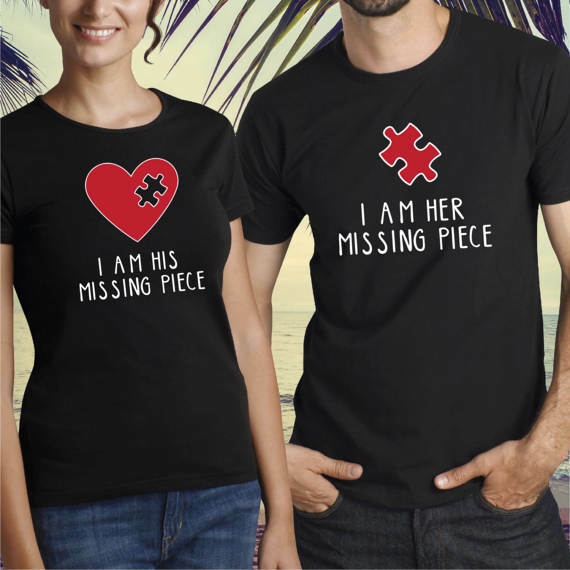 The notion of puzzles is just excellent for couple tee designs. This is another example that may fascinate you. Each of the abstracted boy and girl is holding a puzzle with a half heart shape. When they are put together, the full heart shape will be completed. This is sweet, right? OK! Cute design again! No matter you love sushi or not, you will love this shirt design. 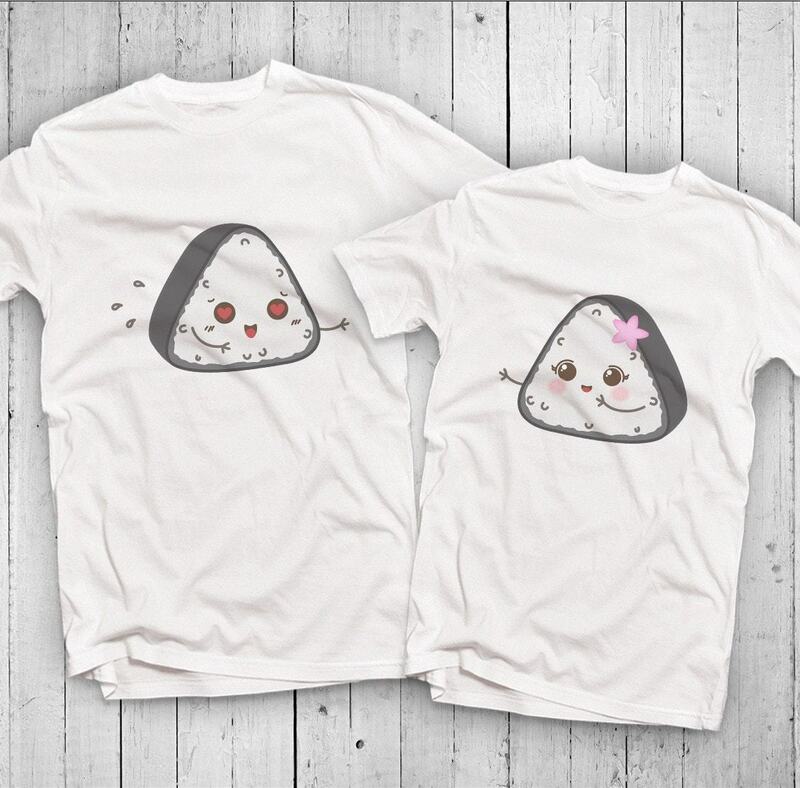 A pair of lovely “male” and “female” sushi is presented on the two shirts. That’s it and the design just speaks itself. This design is a little bit different from what we have talked about before. The main difference is that the prints are at the back of the shirts instead of at the front. You can see a pair of wings on each shirt. Of course, it is an angle and there should be a pair of wings. Two meaning phrases are printed on each tee. 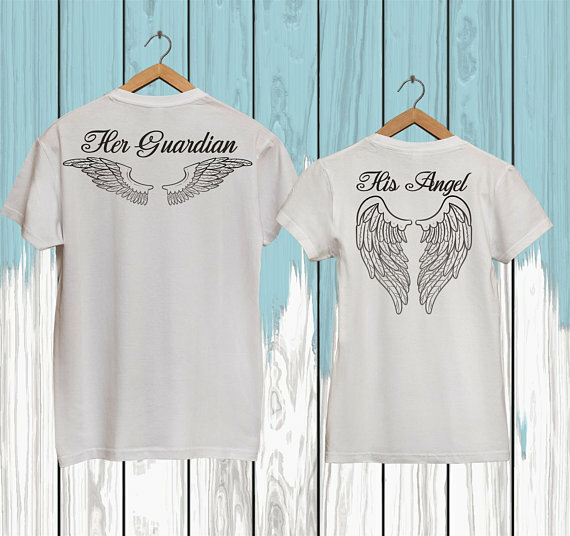 They are “Her Guardian” and “His Angel”. It is just you and me! In this design, the idea is expressed as Her and Him. You can see “HER” on the female t-shirt. On the other hand, you will see “HIM” on the male one. It is just a perfect match. Well, some “older” folks should know this retro game well. Yes, it is the Pac-man. This idea if literally transformed into a pair couple t-shirts. It should be something interesting. 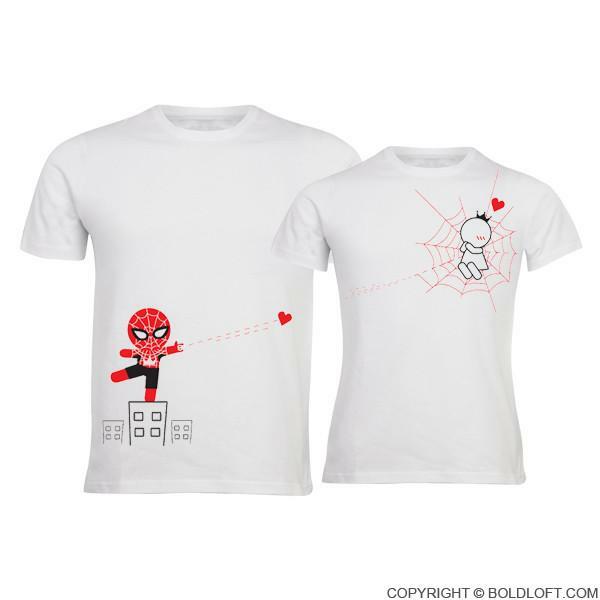 If both you and your another half love this retro game, you should try to get this tee. Of course, you should also go on the street and wear them together. This will amaze other “older” folks. For this design, we just go back to the idea that both of you will wear shirts with the same design. Yet, this design is just too excellent that we must talk about it. 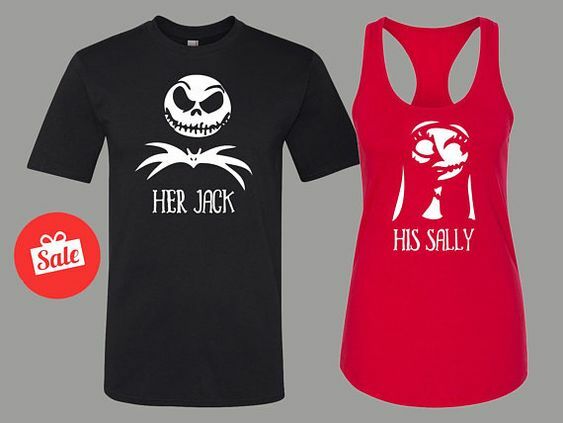 In fact, the full name of it should be “Suicide Squad Couple Shirts No Matter How Insane You May Be”. 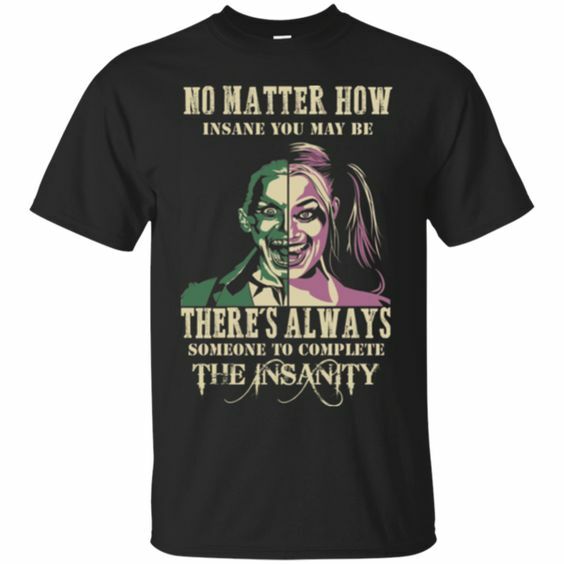 In this tee design, there is half an insane man and half an insane woman. Then they form a whole person. We just love the the insane man and woman are drawn. You will also love it we guess. 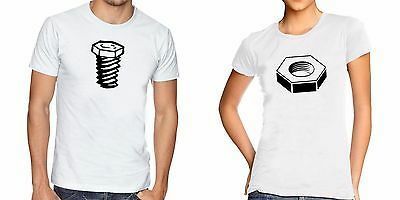 Without any surprise, a bolt and a nut is a perfect match. There is certainly no need to explain about it. So, it should be an excellent to make it a couple tee design. Now, you can just see it here. You can see a bolt and a nut. When you are wearing it, they are a perfect match. And you two are also a perfect match. You will not see a couple hugging or kissing in this design. However, you will be able to feel it from the graphic elements. Right! You can only see the legs and feet of a couple. From these graphic elements you can just imagine that they are either hugging or kissing. This is something excellent because this design requires your imagination to make it complete. This design is inspiring. You can say that the it is not very sophisticate. The two shirts will become one whole “face” when they are put together. Well, it is still face which depicts half a male and half a female. But it is sweet. Another design with a Korean style is here. 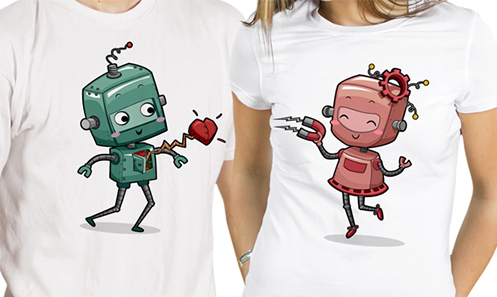 The couple on these shirts are just sweet. The heart shapes tell us that they love each other. It will also tell all the others that you love your another half. The figures on the shirts are drawn in a very cute and lovely way. You can feel the love within. Of course we are just kidding. You will not become a prisoner. Love is not a prison anyway. But this is the main idea of this design. We will still say this idea is very sweet. The shirts are designed like a prisoner’s photo. The boy is holding a board with the words “LO” and the girl is holding the one with “VE”. Right, this just becomes LOVE. The title of this design is quite self-explained. Usually, we will have jam or butter on bread. 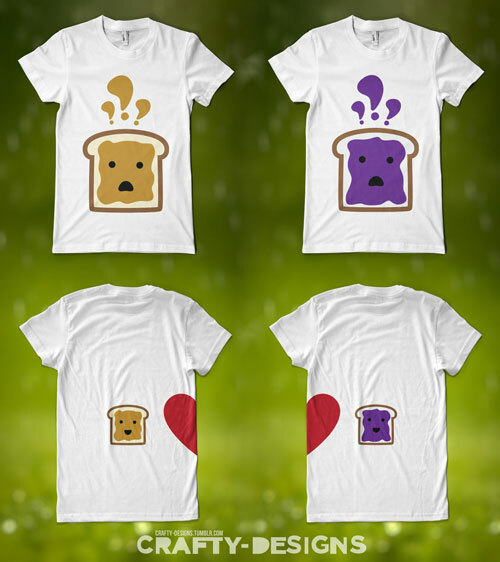 This design is cute in a sense that the bread with butter / jam is drawn in a very lovely way. 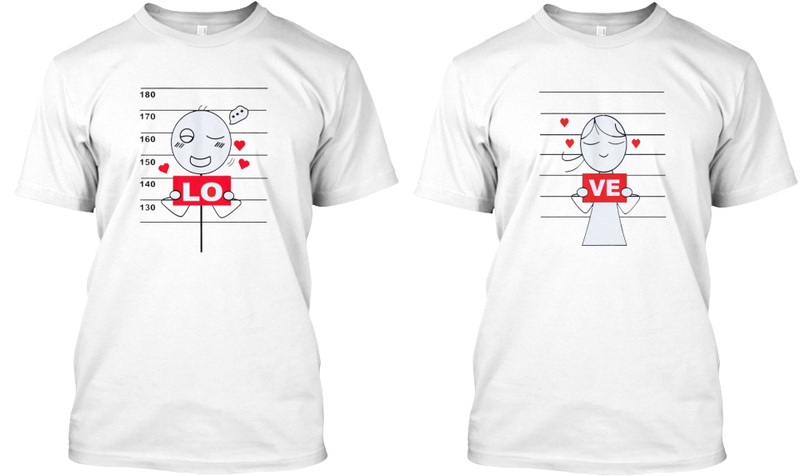 Both the front and back of the couple tees were printed with images. There is also a half heart shape on each shirt. Again, they become one when the shirts are put side by side. A romantic design can be seen here. 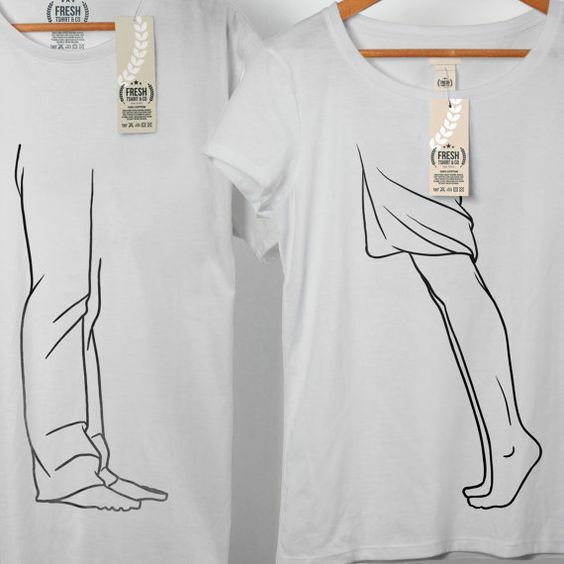 The design is depicted with two pairs of shoes on each of the couple t-shirts. Of course, one pair is for male and the other pair is for female. 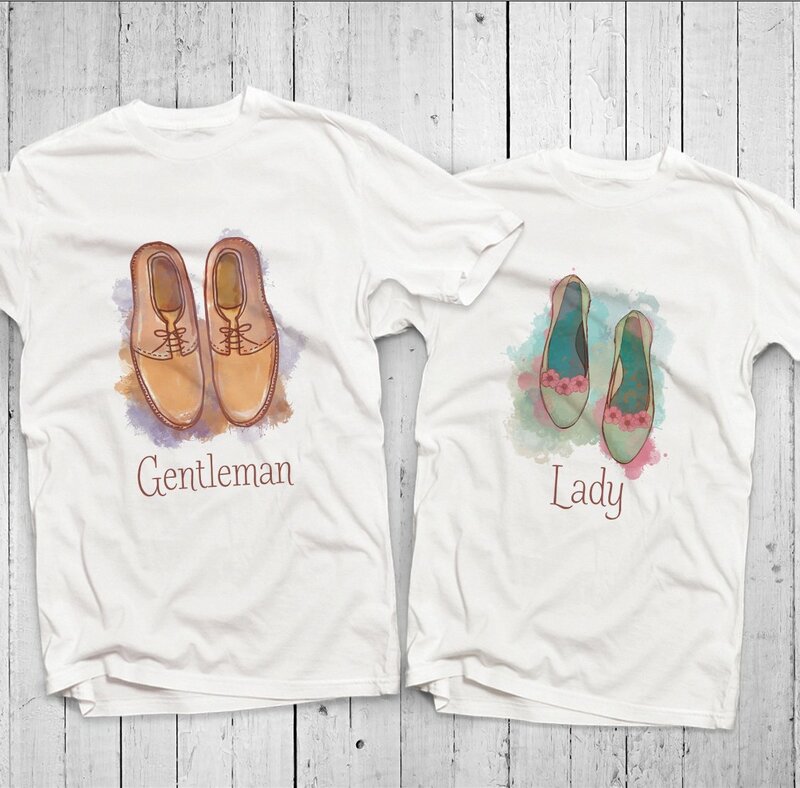 The words “Gentleman” and “Lady” were also presented on the tees. What makes this design outstanding is that they are drawn like watercolor. This idea is quite similar to the one about butter, jam and bread. Yet, we talk about Nutella now. Of course the design is also different from the previous one. 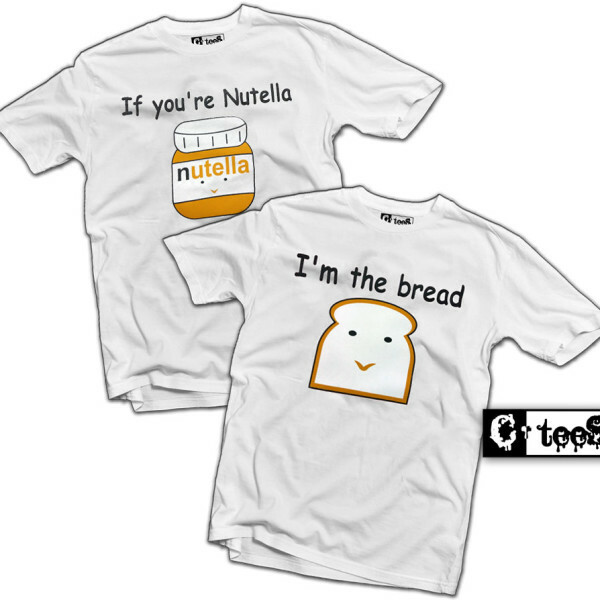 On one of the shirt it is the Nutella and on the other one it is the bread. The concept is different from the one we mentioned before but it also expresses the idea of being a perfect match. What will you usually do when you are watching a movie. I guess you will also have some coke and popcorn. So, they are a perfect match in the cinema. This design is all about these when you are watching a movie. Let us emphasize it once again – Popcorn and Coke are a perfect match! She is captured by your love! This design is actually very interesting. There is a spiderman. He uses his web to capture his another half. You can see that the girl in fact loves this spiderman. Yes, they love each other. So, maybe it is actually that they have captured each other. Actually, the name of this design should be I Love This Girl and I Love This Guy. This design is mainly composed by using these two phrases. The character “O” of the word “LOVE” is expressed as a heart shape. There is also an arrow of each shirt to point to your another half. This is a pair of matching tees. The design depicts a cute image of a dinosaur. 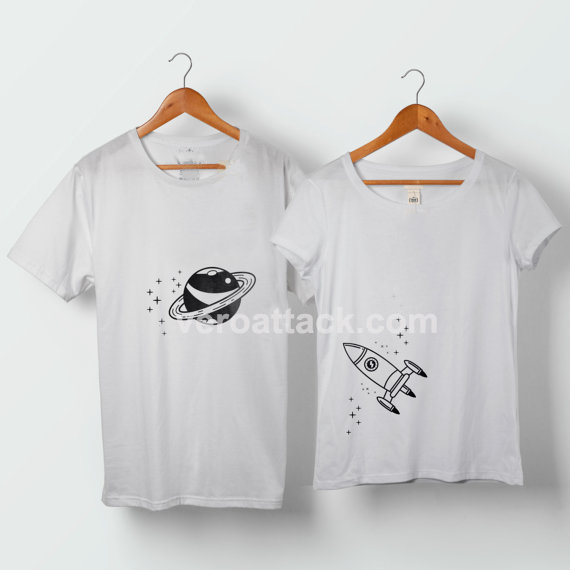 This design is so lovely that you will want to wear this tee even if you are not putting it on as a couple t-shirt. A pumpkin and pepper is a power couple. This idea is expressed in this design. The only pity is that both the pumpkin and pepper are printed on one shirt. 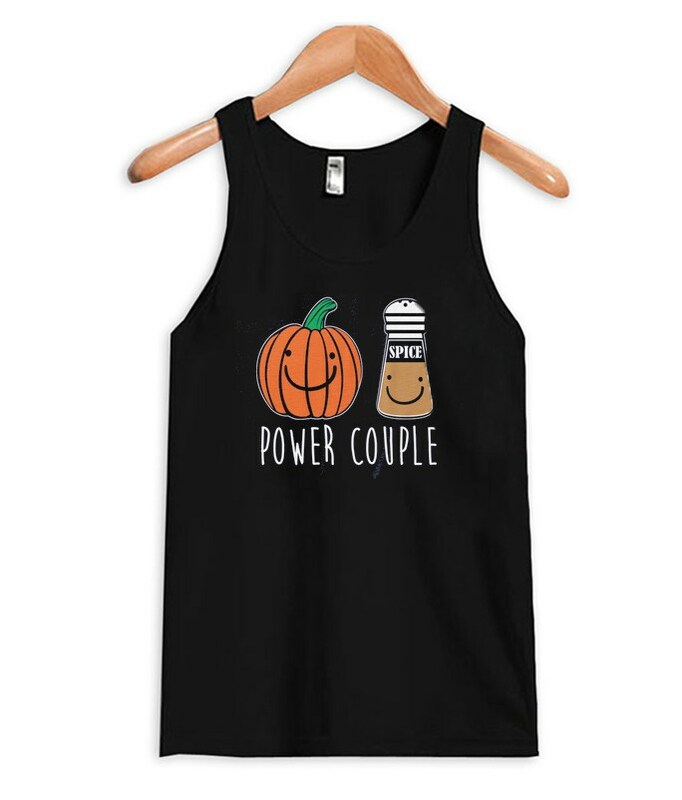 As a concept of couple tees, we would certainly like to see a pumpkin printed on one shirt and a bottle of pepper printed on the other shirt. But this idea of a power couple is for sure a good concept at the end of the day. You may also want to tell the others that you are a couple when you are going to a Halloween party. Go for this design if you think so. You will become Jack and Sally. Well, you should understand it. They are the most horrifying characters in the world. So, they are a couple! Love is all about the connection between two people. It is also about the connection between two hearts. 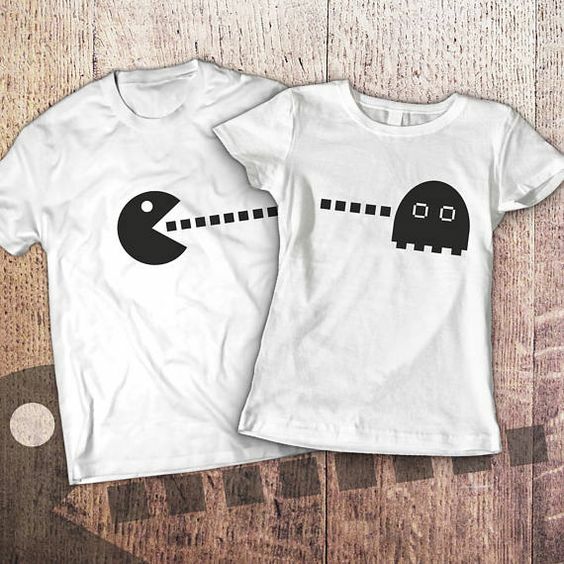 It is just something perfect as a concept for couple t-shirt design. 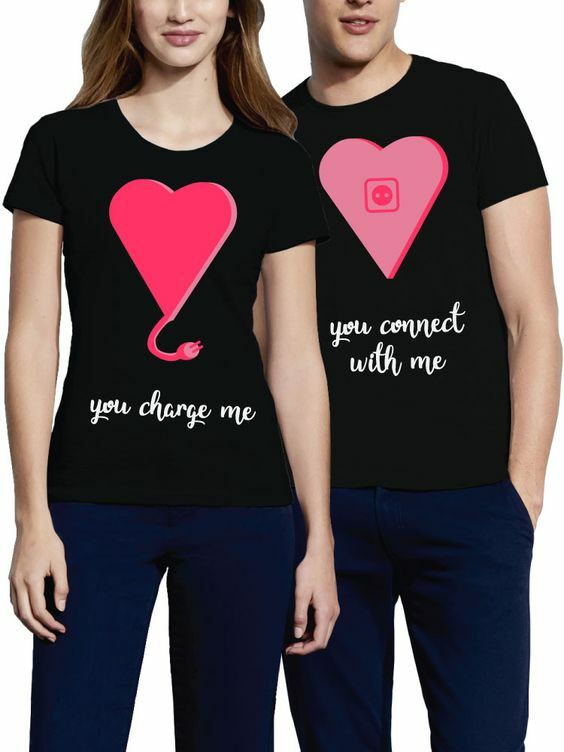 From this tee design, two hearts are connected by a power cable. So there should be another layer of meaning here. One of the two people is powered by the other one, and vice versa. This is a romantic and interesting idea! A pumpkin is a very popular design element for Halloween. This is why this design is so perfect for a couple who are planning to hang out in Halloween. The design is not very complicated. 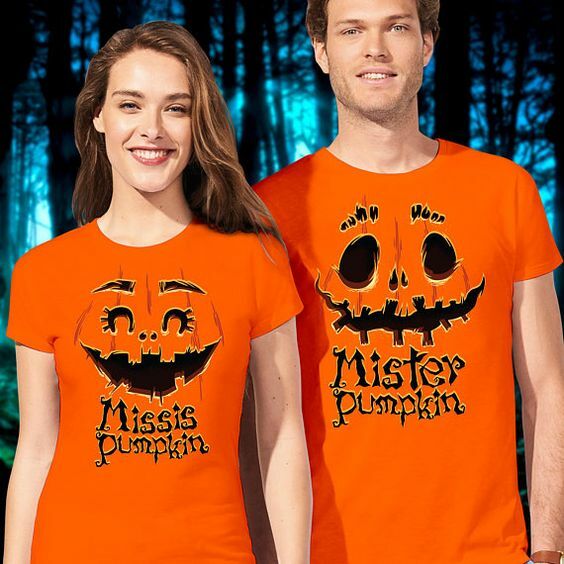 A pumpkin design is used and the words “Mister Pumpkin” and “Miss Pumpkin” are put on the tees. They are simple but easily show the others that you are a real couple! 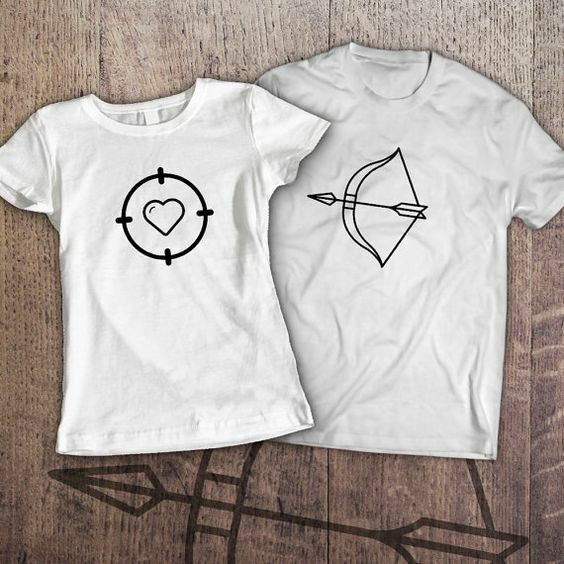 The main concept of this design and archery and heart. The heart is the target. You should be able to guess the whole meaning of it now. We suppose it is needless to explain further! This is the second retro design we talk about here. The idea certainly comes from some retro video games. The heart is drawn with a pixel style. 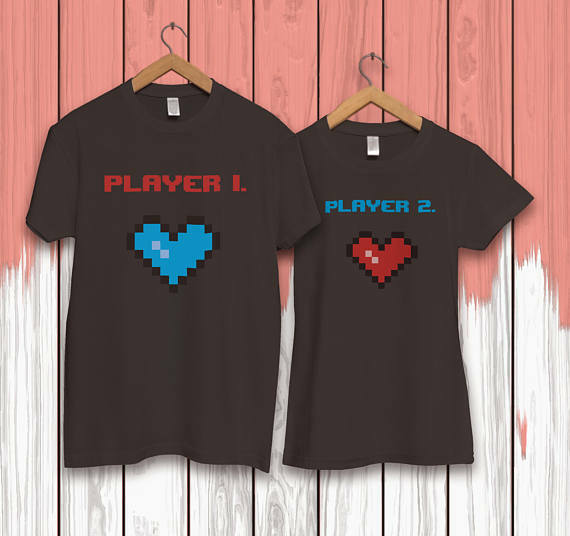 “Player 1” and “Player 2” are also printed on each of the tees. Retro lovers will love this design. This is certainly a fairy tale. We talk about a captain and a mermaid. The design is mainly composed of words and simple graphic elements. 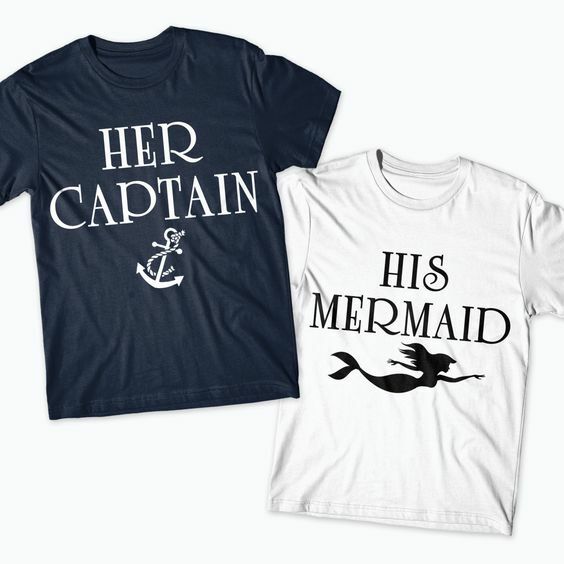 “Her Captain” and “His Mermaid” are the words you will see. An anchor is drawn to signify the captain and a mermaid is also drawn. So, it is a pair! This is a pair of couple t-shirts which mainly about the words on them. On the tee the man wear, you will see words like “Support Her Hustle”, “Support Her Heart”, “Support Her …” and so on. 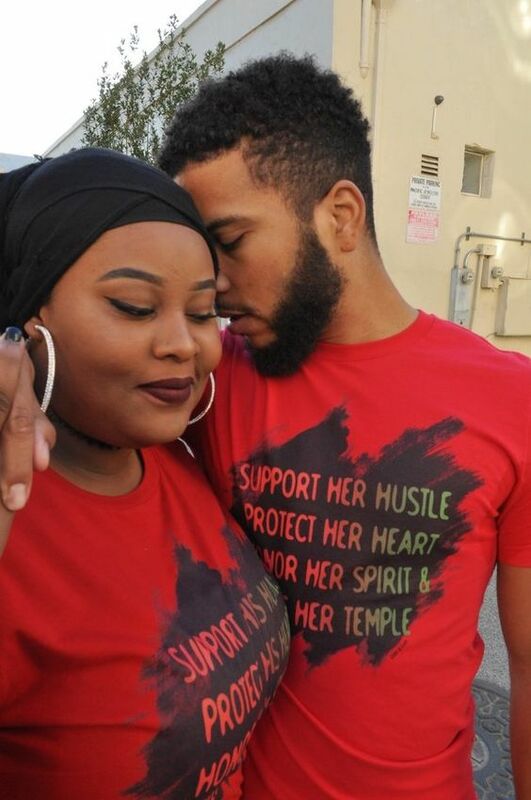 On the t-shirt of the woman, “Support His Hustle”, “Support His Heart” etc. are printed. It is a simple but touching design.